A torrent of information about the fast growing online advertising market in China has been coming out recently, and all point to significant growth. Baidu.com: Revenues increased 270% year over year. In the fourth quarter, Baidu's revenue to 114.9 million yuan (USD $14.3 million) from 42.9 million yuan (USD $5.3 million) a year earlier. Als o, the number of parties using Baidu's ad service rose 19% from the July-September period to more than 63,000 showing clear interest in more and more advertisers who are interested in their PPC model. Sina.com: Advertising revenue came in at $25 million in the quarter, up 37% year-over-year. At these growth rates, both companies look likely to be generating over $100 million in advertising revenues in CY2007. Lastly, the UK's Guardian Unlimited Online has an article with many stats about this growth as well. Particularly interesting is the quote they have from Hans Yu, managing director of Nielsen//NetRatings in China about the size of the online market: "…we’re finding that the market is actually far bigger than people think when you start to include people who only surf every now and then, perhaps on a friend's PC or at a cyber cafe." As the number of online users continues to grow, \nline advertising revenues are sure to follow. BIDU beats. China Internet is growing faster than people think. Baidu just announced 4th quarter 2005 results, and they beat estimates. The numbers are still small (expected $12 million+ in revs and they did $14.2 million). But the directional information from their quarter is the important takeaway (up nearly 30% over the previous quarter). The bottomline: The Internet in China will grow faster than people think. Paid search and Baidu will help drive the market. My guess is Baidu could do close to $100 million in revenue in 2006 at this pace. That starts to get interesting. If they take 20% marketshare of ads, that would mean at least $500 million in online advertising in 2006 in China. My guess is that online ads in China end up higher than that. Still, just 3% or so of the U.S. market. The tipping point is a few years out in China. So, you can expect 2008-2010 will be huge years. The takeaway for U.S. Internet cos: GET TO CHINA NOW AND SET UP SHOP. 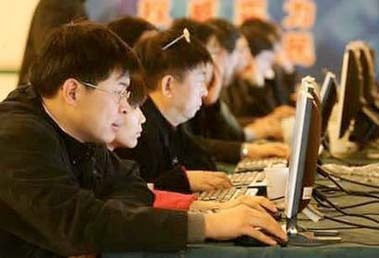 There have been a flurry of articles in the last few days that discuss the role the Internet is playing (and will likely play) in China in terms of “opening up” the country and how the Chinese government is working overtime to keep in check the type of information that is made available to its citizens. There are many facets of this discussion, and the answer isn’t as cut and dried as some would have us believe. A good illustration of how the Internet is helping to increase the flow of information in China (even information that the government would otherwise hide) is told in a Washington Post article from this weekend. The article covers the story of how a senior editor at the China Youth Daily created a major stir by posting a "blistering letter on the newspaper's computer system attacking the Communist Party's propaganda czars and a plan by the editor in chief to dock reporters' pay if their stories upset party officials." The Post article chronicles how the Chinese government pressed hard to eradicate all postings of this letter, or postings about it, from the China-accessed Internet. At the same time, it pointed out "the profound impact of the Internet on political discourse in China, and the challenge that the Web poses to the Communist Party's ability to control news and shape public opinion, key elements to its hold on power." The “profound effect” they referred to in this case was in reference to the vast number of Chinese citizens who quickly mobilized and used various technologies (from email, to IM, to bulletin boards) to spread the contents of the letter far and wide to others who would otherwise not have a chance to read this dissenting view. Add to that story Newsweek’s article “Blogger Nation” that discusses how blogs have given Chinese citizens an outlet to exercise a form of freedom of speech. They quote a popular anti-government Chinese blogger as saying "Blogs are filling in the gap between the freedom the government allows and the freedom it should allow." Further, they quote the founder of Bokee, one of China’s largest blogging platform providers, as saying "There's no other use of the Internet that will bring greater reform to Chinese society." Hyperbole aside, all of this demonstrates how the Internet, and web-based communications technologies are empowering and enabling an increasingly greater number of Chinese citizens to find their voice. This has to be viewed as a good development to those who desire for China to become a more open, less authoritarian country (including those in the U.S. Congress). So, despite the sophistication of Great Firewall of China, industrious Chinese citizens will likely continue to use the Internet and Web-based technologies to play a cat-and-mouse game with the government to try and have their voices heard and to disseminate information. We take something like this for granted in the U.S., but this could have a monumental impact in China. China, you have Chinese companies that hijack their business models and the Internet is global so what do you do?" As reported in China's business publication The Standard, the market research firm iResearch recently released some new information on the growth of online advertising in China. Spending on online advertisements surpassed that of magazines last year. The online market yielded 3.19 billion yuan (USD $396M), compared with 1.8 billion yuan (USD $223M) from magazines. Leading portals such as Sina and Sohu have a 30 percent annual growth rate in online advertising revenue, while the smaller but fast-growing search engines, such as Baidu, have an annual growth of more than 150 percent. The online advertising revenue in China has grown from 0.5 percent of all media spending in 2001 to 2.3 percent last year. This compares to the roughly 5 percent US firms spend online. Advertising and Search To Benefit. The dual increase in cost of labor and marketing will make the operating margins much more realistic and sustainable, in the 15%-40% range rather than over 50% that was common in China early on. A key beneficiary of this trend will be ad-based companies...such as online portals like Sina, Sohu, and Netease [who] stand to benefit from their key assets: inventories of ads. Piper also expects search destinations to become more valuable to an increasing number of Internet companies, because wireless SPs "have been using very little sponsored search for customer acquisition" and they "believe this trend will begin to change in 2006, as competition in search and Google's push for a better search engine will create more useful search experience for users, creating a virtuous cycle that should lead to more advertisers coming to search as well." All of this clearly demonstrates that online advertising is coming on strong in China as many have expected. As China becomes the number #1 internet market in the world, this trend will continue to accelerate. As reported by News.com, "There are 8.34 million small and midsize businesses (SMBs) in China--99 percent of which are small with between one and 99 employees, according to AMI-Partners. The research firm added that medium businesses with 100 to 999 employees make up the remaining 1 percent of the Chinese SMB market." First presentation at the Bekeley Asian Business Conference on the Gaming topic was given by Vincent Tong from EA. PC online gaming is where the money is. 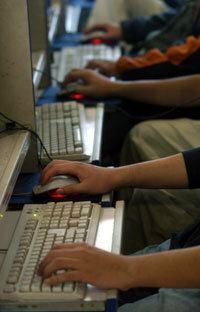 Online Gamers in China 25M+ online gamers in ’06 and growing significantly in '07. The afternoon keynote at the Berkeley Asia Business Conference was given by John Chen, Chairman, CEO and President of Sybase, Inc.
4. Localization: “When in Rome..."
First keynote speaker is Sukhinder Singh Cassidy Vice President, Asia-Pacific & Latin America Google, Inc.
Asia represents over half of the world's population. and 35.7 of worldwide internet usage (but is only 9.9% of those countries' population). Asia business must be managed as a portfolio, focusing on each market, and the area as a whole, which is a "challenge, and a delight, and sometimes quite stressful." Offnet Search - This is getting on a path outside of walled garden to get to actual the Internet. Given that the long tail applies for mobile as well as PC, without the Google search it is a suboptimal user experience. Beyond user retention, revenues should increase from additional browser use (pay for transferred MB) and from variable revenues such as subscription fees to access internet. Wireless advertisng – Starting now in Japan with AdWords, using the same platform as the web. Just experimenting, but positive initial response. Ads must be very relevant due to less screen space with fewer listings to resonate with users. SMS revenues. GOOG already offers SMS services in the U.S. No need for WAP browser. They expect this to be part of the mix in Asia. In Asia the tail is even longer due to the vast number of people and companies.Asia requires new ways of approaching the market, such as their China AdWords reseller program. China, this was the first time they started a reseller market before a direct market. China reseller revenues have grown very steadily from August through December [no actual numbers were provided due to Sarbnes Oxley]. No direct sales yet. “The program is highly successful and up and to the right.” The cale and magnitude as a Channel is fairly significant for Google. The see acquisitions as an opportunity to acquire a massive talent pool (for focusing on local development and more). They know they need to go where talent is (vs. trying to get everyone to Mountain View). They don’t treat local operations as translation centers, but these groups do typically focus on local issue (which sometimes can apply globally). At this Berkeley Asia Business Conference today. After just a copule of speeches/panels, it is clear that China is dominating the discussions (90% of discussion is on China, vs. other Asian countries). In fact the moderator from the first panel said "this is overwhelmingly a discussion on China as that's what the audience is pushing for." "At least six China internet firms will tap overseas markets this year to raise between US$500 million and US$1 billion in initial public offerings, according to an industry research report." Their director of the ISC estimates that he believes "the [China] internet companies could raise between US$100 million and US$200 million each on the US Nasdaq." It estimates that total revenue from internet users in China would increase 52.5 per cent year on year to 286 billion yuan (USD $35.5B), up from 186 billion yuan (USD $23.1B) last year. The average revenue per user each month was 157.80 yuan (USD $19.6) last year. China had 110 million internet users at the end of last year, up from 103 million in 2004, and is expected to continue to grow at 12 per cent this year. The report is also predicting that Web 2.0 type companies (especially blog and WAP related) will be big drivers next year. Given that Web 2.0 is so hot in the U.S. as is widely being reported, and a good amount of these companies are being funded, its not suprising that Chinese entrepreneurs would be also looking at building these types of businesses. However, given that many of the U.S. Web 2.0 companies are in essence "features" posing as companies (which I saw many times while at CNET during the dot com boom), I'm expecting to see even more of this in China. Why? Because many of the China Internet start-ups are being launched by first-time entrepreneurs who are doing anything they can to get in on the perceived gold rush, and many will likely confuse a cool product with a solid business idea that has a sustainable business model. But just like in the U.S., where there are and will be promising new start ups, China will develop more than its fair share of solid Internet businesses, as is evidenced by the possible IPOs mentioned in the ISC report. The size of the market, its huge number of Internet users (eventually far more than the U.S.), and the hunger of the Chinese entrepreneurs, makes this a virtual certainty. As Google's stock takes a dive from $475 to $367, I am reminded of my meeting recently in Beijing with Bill Bishop . Bill and I go way back to the beginning of the U.S. Internet in the mid-90s in San Francisco. Bill was at MarketWatch and I at CNET. Anway, I have been the non-stop bull on Google's stock. To date, I have been right on Google's northward climb. However, this last meeting with Bill, he raised much caution on the meteoric stock. And this time, HE was right. I was well aware that Google could drop by this amount in a short period of time, but I wasn't expecting Q4 quarterly earnings to be the trigger. Although I actually think their quarter was pretty good. I understand why the stock dropped so much so fast. * They missed the whisper numbers. Period. They did. * I am encouraged by the fact that the revenue was on target. That, to me, is the biggest thing to focus on. * Because of tax issues and a big contribution to the Google Foundation (among other things), Google expenses were higher than everyone (including them) thought. * Jim Cramer talks about the "Eric Schmidt discount." I must admit it does look bad when the company so blatantly snubs its nose at Wall Street. I am less concerned about quotes from execs like, "we remain relentlessly focused on a great user experience and great product." And I am more concerned about Eric Schmidt saying this and then taking lots of the table (hundreds of millions of dollars in the past year) along the way. If the street starts to think he is just sucking up to Larry and Sergey while stuffing his pockets and messing up quarters...that's a problem. * A bull point of view is that they are so big and growing so fast and still so young that this was inevitable. Herb Greenberg from TheStreet.com put it best, "not even SuperCFO with x-ray vision" could have seen the tax issue coming, etc. In short, Google is a victim of its own success. * Look for future quarterly earnings announcements this year. I guarantee you at least one will bring an opposite reaction. There will be a Google lovefest at some point again this year. I am reminded of last year. In March 2005 my portfolio was down 30%, by the end of the year I was up over 80% (my best year ever). (Talking about Google's stock drop)"It is a relief to have this out of the way. And here is the silver lining: If Google is the company I think it is, this is almost certainly a buying opportunity for long-term investors. Let's look briefly at the earnings that caused the havoc. Earnings were $372 million, up 82% from a year ago; revenue was $1.92 billion, up 86%. Margins, already above 60%, improved slightly. In other words, stellar results. 'We actually think we had a strong quarter,' said Google's chief executive, Eric Schmidt, seeming somewhat befuddled by the stock collapse." "I still own my Google shares, and may well add to them (I ACTUALLY DID AT $380). I've vowed to be the kind of investor Google's founders said they wanted at the time of the IPO: patient, supportive of management, not obsessed with quarterly earnings results, and not trading frantically in and out of the stock. In return, my hope is that Google turns into one of those few companies that both transforms society and makes its investors wealthy. Opportunities like these don't happen very often."